Part II: Heat and stability issues. Part III: Performance: suggestions. Test your PC. Part IV: Save money: upgrade your old PC for only $35. This page is for anyone who wants to extend the life of his old computer and avoid buying a new one. This suggestion is based on the principle that a computer is only as fast as its slowest component. The four main components that affect the speed of a computer are the CPU, the motherboard, the memory and the hard drive, in that order. There are more components, but I want to keep this explanation simple. When you ask a computer technician how to improve your computer, the first suggestion is usually to add more memory, but there is an upgrade that has a greater effect: the hard drive. For the purpose of this experiment, I used a really slow computer (painfully slow by today's standards), a Dell Optiplex with a Pentium 200 CPU and 96 Mb of RAM memory. After removing the original 2 Gig hard drive, I installed a new Hitachi 80 Gig hard drive with a 2 Mb cache. The details of this hard drive are not important, except that it is a brand new drive with the latest technologies and it was very cheap: on sale for only $35 after rebate. The drive came with a cd containing easy-to-use software to transfer the software from the old drive to the new drive (just choose the option to "create as a boot drive"). The only problem I encountered was that my old computer could not accept two hard drives, so I needed to do this on another computer. Once the two drives are connected to the computer, you need to boot through the cd (make the adjustment in the Bios) and just follow directions. One issue worth mentioning is that you probably have an older version of Windows on your old PC, so you do not want a new hard drive with more than 137 Gig for a PC with Windows 98 Second Edition or ME. 60 or 80 Gig is more than enough for most of us anyway. [You can skip to the next paragraph if you want to avoid the techical terms.] The next step was to create a huge page file since I had so much room on my new hard drive: I was only using 1.4 Gig out of 80 Gig! On the desktop, right-click on MyComputer and click on Properties. Click on Performance and then Virtual Memory. Choose the option to Let Me Specify My Own Virtual Memory Settings and then enter 500 in the min. box and 500 in the max. box, and click OK. Windows will warn you about the setting and ask if you want to continue, and you click Yes. A 500 Mb page file is huge and far more than Windows 98 SE will ever need, but there is plenty of room on the new drive, so why not. The improvement really caught me by surprise! I tried five different software processes to compare this computer to my other computer. Comparing this Dell 200 with its previous performance, the improvement was dramatic. Speed and reliability improved very noticeably and the performance was respectable (and very impressive when you consider how outdated this machine is). Comparing the Dell 200 with my newer Azza computer with the AMD 2500+ processor and 512 Mb DDR RAM, the performance of the Dell 200 was, of course, slower. To confirm the result, I took the old hard drive from the Dell 200 and installed it in my newer Azza computer, which experienced an intolerable decline in performance, catching me again by surprise. This does, however, confirm the suggestion that much of a computer's performance is determined by its hard drive. If your computer is more than two years old but has a CPU faster than 500 MHz, I recommend replacing the hard drive with a new one. If you can find one on sale, the cost of the upgrade would be really cheap. I prefer Seagate drives over other brands, but Hitachi, Western Digital and Maxtor are good too. Check to see what the cache is: 8 Mb is better than 2 Mb, of course. Think of the cache as the hard drive's own memory, acting as a data buffer for faster and smoother performance. A new hard drive is a wise investment since you could install it in your next computer in the future (though you will probably want to buy another new hard drive at that time: then you could have two hard drives on your computer). There are other ways to improve your older PC. Most internet users have dial-up connections: consider a new updated modem. An easy-to-install external modem would cost about $40, whereas an internal modem would only cost $15. An external modem is the perfect solution for someone without computer experience. The third possible upgrade, of course, is memory. Memory is much cheaper than it was just two years ago. If your computer has less than 128 Mb ram, you could add more memory for about $30, depending on how much you want. If you do not have experience with computers, let the computer store where you buy memory install it for you because the different types of memory can be confusing. When considering how to upgrade your computer, bear in mind that you can now buy, in January, 2005, a new computer with Windows XP (home edition) but without a monitor, for as little as $300 plus shipping from Tigerdirect.com on sale, after rebate. Just wait a week or two for their next sale. This means, however, that it does not make sense to spend a lot of money upgrading an older computer. UPDATE (15 June 2005): An Emachines emonster 500, made in October, 1999, was given to me. My challenge was to see what I needed to do to make it into a computer worth keeping and using. It had a Pentium III 500 MHz CPU with a 512k L2 Cache and 192 Mb. SDRAM (memory). The challenge was to install the fewest components necessary at the lowest cost. An 80 Gig hard drive for $37, plus a newer nVidea 4X AGP video card for $10, plus a newer modem for $5, plus a PCI card with four USB 2.0 ports for $18 all totalled $70 and could be removed to be used in another computer later, so no money was wasted. The only component I needed to buy was the last one, the USB ports. With Windows XP Home Edition installed, this computer was smooth, stable, and fast (because of the 512k L2 Cache). Heat was an issue because of the small CPU fan, so I installed a standard 80mm. case fan ($4) in front of the CPU heatsink, also directing some air over the video card. Another fan would keep the hard drive cool. A third fan, a $15 system blower exhaust fan, installed next to an empty PCI slot, would bring more fresh air into the case. After installing my Netgear WG121 wireless USB adapter, I downloaded the Windows updates (SP2) in about 10 minutes. A performance test at pcpitstop.com suggested that this computer was much slower than my other computers. However, in normal daily use I can hardly notice the difference, making this computer very acceptable for internet surfing, Word, Excel, editing my website, editing photos, even watching DVDs. It will boot into Windows in less than one minute. Since I do not play computer games, this computer is quite acceptable. What began as a challenge became a nice computer. 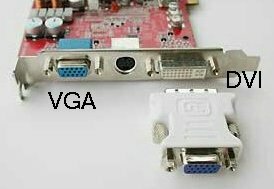 My only complaint is that I was not able to install an 8X video card that would accept two monitors, which my other computer has, and they are wonderful: two monitors make it possible to build a webpage and see it while you build it (see below). Install the second monitor into the adaptor and turn on the computer and the monitors. Windows XP will recognize the second monitor. 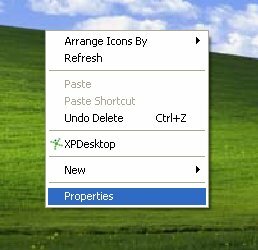 Right-click on the desktop and click on properties. 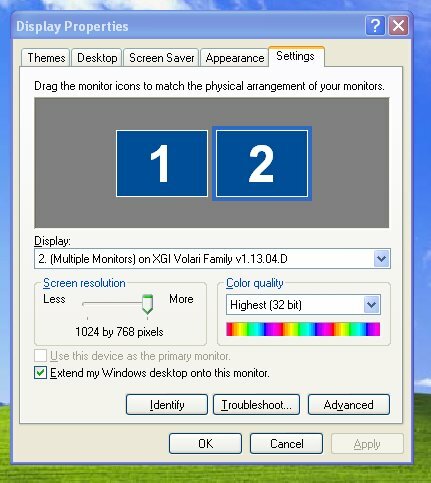 Then click on settings and on the second monitor to adjust its screen resolution and color quality. Finally, you want to check the lower left box to extend Windows desktop onto the second monitor. I had no idea how good a two-monitor setup was until I tried it!